Bacteria are amongst the most adaptable lifeforms on earth, and are able to survive, grow and even thrive in challenging and inhospitable environments. 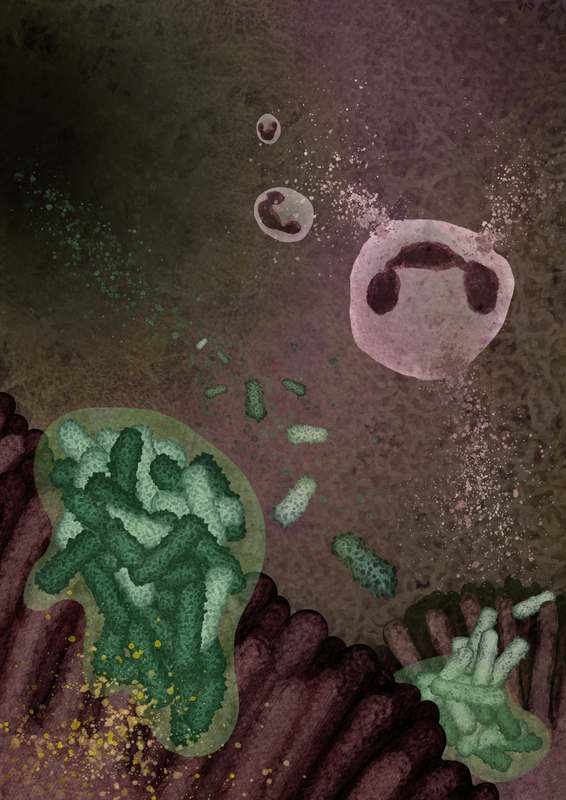 Attempting to understand both the internal cooperation and competition between bacteria, as well as the ways in which they interact with the host, provides so many avenues for research. It was this fantastically complex interplay that led us to this study, examining how common bacterial mutations can influence colonisation of host environments. Pseudomonas aeruginosa is an opportunistic pathogen that can cause chronic respiratory infection in patients with cystic fibrosis and bronchiectasis. It has long been recognised that, over time, the bacteria develop mutations that can be important for adaptation to the host environment. It has been suggested that loss-of-function mutations lead to the gradual development of a better adapted but less virulent clone. However, we and others have previously shown that diversity within these bacterial biofilms is huge and persists over long periods of time within patients. We wanted to understand whether the mutations that pepper the P. aeruginosa genome during chronic infection inevitably lead to a more dormant state and why we tend to see maintenance of population diversity rather than outgrowth of a single dominant clone. P. aeruginosa has a large genome and approximately 120 two-component regulatory systems that enable environmental sensing, linking bacterial behaviour to changes in local conditions.We had previously identified a mutation in such a system, in a gene called pmrB, in P. aeruginosa isolates adapted to the respiratory tract. The PmrAB system had previously been linked with resistance to polymyxin antibiotics, but since there was no antibiotic pressure in the model system in which we identified the mutant, we looked towards possible host pressures. Antimicrobial peptides are produced in abundance in the respiratory tract, by epithelial cells and cells of the immune system, such as neutrophils (Figure 1). We reasoned that such molecules might exert strong selective pressures in vivo. After testing a few host antimicrobial peptides, we were excited to find that mutants in pmrB were highly resistant to lysozyme. We then turned to testing antibiotics, expecting to see a similarly resistant phenotype. 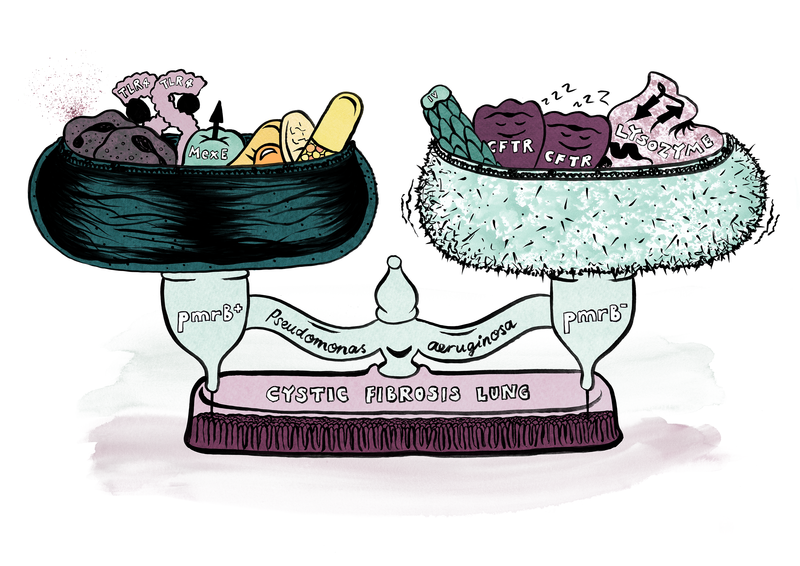 To our surprise, we identified the exact opposite effect – increased sensitivity to several different antibiotic classes. However, pmrB mutants were highly successful at colonising host environments in our model and had been identified (displaying similar phenotypes) in isolates from patients. So could these “loss of function” mutants actually be conferring different traits that may be beneficial in the host? We used proteomics to identify proteins with differential abundance in the wild-type P. aeruginosa compared to pmrB mutants and this revealed some more unexpected but intriguing results. Firstly, the mutations in pmrB, rather than leading to downregulation of protein production, actually led to enrichment of 60% of the proteins identified. Within the 216 proteins with differential abundance, many interesting pathways were revealed. Some of the highly abundant proteins in the pmrB mutant explained our previous observations of lysozyme resistance and antimicrobial susceptibility. We then embarked on further phenotypic testing in order to characterise other features of the pmrB mutant. 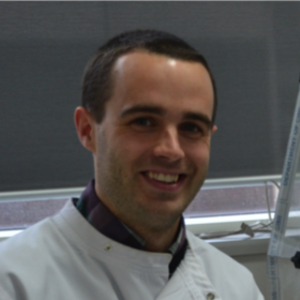 Firstly we found that the mutant was able to downregulate the expression of the cystic fibrosis transmembrane regulator (CFTR) on airway epithelial cells. This exciting finding suggested that these variants of P. aeruginosa could have the ability to “phenocopy” the CF lung environment by reducing the levels of CFTR on host cells. This would, in effect, enable them to modulate the local host environment, producing conditions more favourable to bacterial growth. The mutant bacteria also displayed greater motility and airway adherence, traits that may be advantageous in colonising host surfaces. There are clearly trade-offs associated with the presence of different mutations. In this case, pmrB mutants acquire resistance to host antimicrobials, enhanced colonisation potential and motility, but at the cost of enhanced antibiotic susceptibility (Figure 2). Such trade-offs may account for the diversity of genotypes seen in chronic infection, as different members of the colonised community provide different benefits to the population. Many unanswered questions remain. Are there temporal fluctuations or clear spatial structures associated with different mutations? Are the roles of two component systems in infection understudied? Can certain mutations be biomarkers for adaptation or even identify a window in which antibiotic treatment may have enhanced success? Perhaps the development and use of novel model systems capturing both immune and antibiotic pressures will allow us to answer these intricate questions. Nature Reviews Disease Primers on Influenza. Not just another review on influenza, but a CEIRS review.